On the other hand, if you’re building a CMS or utility helper method, you do not want to filter out the HTML a user might type. They probably need to enter some HTML which you’ll want to show to all the other users. Same thing goes for code your app might generate. First, the good news. MVC protects you in several ways against any sort of HTML / JS injection issues. When you write out string contents such as below, it HTML encodes it by default when using @. That is &lt;script src=’evil.js’&gt;&lt;/script&gt; in view source, which is perfectly safe. In this case, you must be VERY careful when you write out the commentText values later. So far we have seen that by default razor outputs text in a safe way using @value. Also, POST requests are blocked if they have dangerous content unless you let it in. View the safe forum and unsafe forum sections to see what happens. You can download the code from the sample as well. But what if you trust the input and need MVC out of the way so you can write true HTML content to the browser? One such example might be a CMS you’re writing. There are two cases you would treat differently here. Is your HTML coming from data given to your view or from code called by your view? rather than @cmsSectionData. This will make the contents of cmsSectionData part of your HTML in the view. You will also need to disable validation on any edit pages using [ValidateInput(false)] as shown above. Check out the CMS section of the demo to see it in action. But MVC’s encoding for @ would block it for sure. You could wrap it in an @Html.Raw() but there is a better way. The purpose of this class is to inform MVC to get out of the way and NOT encode the contents. 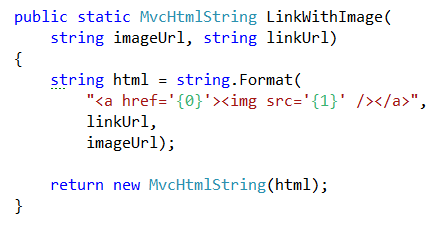 So simply changing the return type of LinkWithImage to MvcHtmlString fixes it. Check out the Helpers section of the demo to see this in action. There you have it. Three ways to encode or avoid encoding HTML data in ASP.NET MVC applications. Reblogged this on My Web Anecdotes. LOL, that made me laugh, thanks! Luckily WordPress also does HTML encode. So, are you basically left to either HTML encode everything you display or, if you want to display raw HTML, to “trust the input”? What if you both want to be protected against evil input AND output raw HTML? Yes, to a degree that is what MVC / ASP.NET provide. What I’ve done on recent projects that require untrusted but formatted input is to use Markdown. There is a cool editor and server-side library called MarkDownDeep which has worked the best for me. That allows some formatted input but there are no script issues provided you disallow that type of input (easy enough as you’ve already seen). Reblogged this on Rexhep Kqiku.